CHAUVET®, a leading manufacturer of LED lighting, announces the Circus™, a room-filling, high energy effect light able to simulate the performance of a moving light without the complication of internal moving parts. 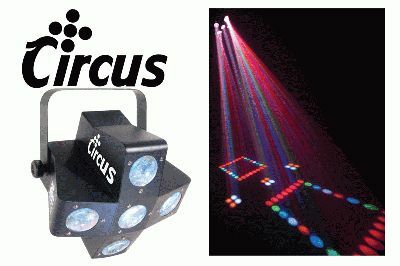 Circus™ features red, green, blue, white and amber LEDs housed in five separate, synchronized pods projecting ever-changing color effects using razor-sharp flowing beams making it an easy-to-use fixture ideal for mobile DJs, bands and clubs. With the Circus™, you can cover an entire dance floor and achieve astounding aerial effects with or without fog. You can also take advantage of the built-in automated programs available in the Circus™ via master/slave mode or DMX control. By power linking up to 12 Circus™ fixtures, you will save space and time running cables and extension cords. User-friendly settings on the Circus™ provide versatility and enhance the unit’s overall performance.